A rich and suspenseful novel about two enterprising young women who unwittingly run afoul of the notorious Jewish Purple Gang in Prohibition-era Detroit. The year is 1928, the height of Prohibition; the setting is a resort town on the shores of Lake Michigan. The Bearwalds are the only Jewish family in town, owners of the local dry goods store. Cleo, the elder daughter, is a beautiful, autistic twenty-year-old who, in her own way, operates more successfully than her loved ones. 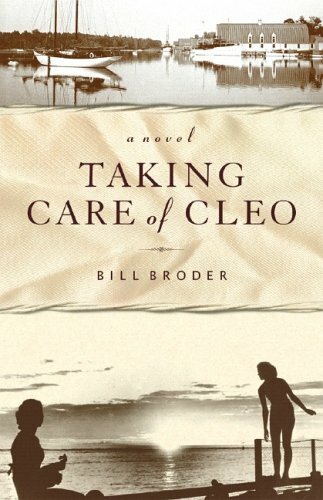 Rebecca, eighteen, yearns to escape what looks to be a lifetime of "taking care of Cleo"—the only role her parents see for her. Cleo herself has other ideas. The novel's intricate plot is set in motion when Cleo discovers a beached bootleggers' yacht filled with illegal liquor. Using materials and tools from the boatworks where she is an apprentice boatwright, she renovates the yacht and coerces her sister into helping her to sell the liquor so that Rebecca, who is unaware of the plan, will have money to attend the University of Michigan. Cleo's activities cause the Purple Gang, famous Jewish gangsters out of Detroit, to mistake her father for a rival bootlegger, with near-fatal results. Running through Taking Care of Cleo is a subtle and life-affirming reevaluation of autism, which becomes one bright thread in a novel that is by turns serious, ironic, and comic, and ends with a happy surprise. Bill Broder is the author of The Sacred Hoop and, with Gloria Kurian Broder, Remember This Time, a novel. His play Abalone was produced in Carmel, California. He received a Marin Arts Council Grant for Taking Care of Cleo. He and his wife live in Sausalito, California.